Hello everybody! Monday is here and so is the newest edition of Weekend Twitterings. It's good, trust us. You went to some really strange places, did some truly silly things, witnessed girl fights and what not. Also, we're happy to report that somebody finally explained the typical Downtown Minneapolis weekend dress code to us. 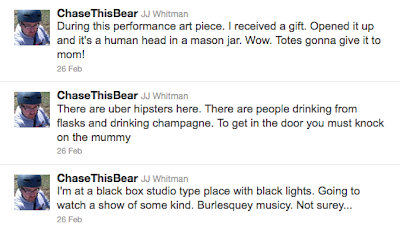 Jay's #partybus2011 tweets were positively hilarious. We seriously need to do this sometime. But, but.. it would have been such a great television moment if she actually said no. 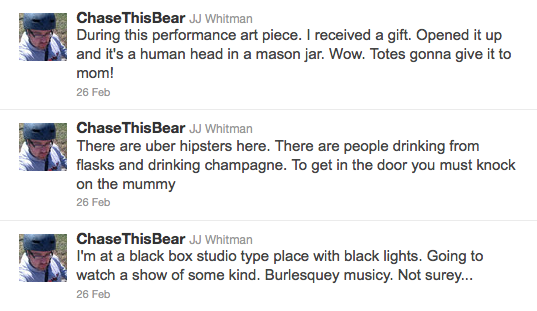 JJ gets the triple tweet of the week honor for his coverage of some "burlesquey" event. Mark is a good boyfriend. It's a fair warning, don't you think? Voltage 2011 is almost here! Was is to "I'm Every Woman"? That's a great song. And the Best Oscar tweet goes to... Neil Olstad! You lucky son of a gun.